Mayor Bob McMahon has proclaimed Saturday, May 2nd through Saturday, May 9th Happiness Week! What better place to celebrate Happiness than Media PA! Of all the factors that have been shown to bring people happiness, Media scores pretty high on all of them. Transition Town Media is hosting Happiness Week to highlight these factors and remind everyone what makes us truly happy. Happiness Week kicks off on Saturday, May 2nd with a Hometown Jubilee, a collaboration of TTM and the local Quaker communities. Hometown Jubilee is an affirmation of our wonderful town and all its people. The festivities begin at 9am with a “Happy Neighbors Walk” from Media Providence Friends Meeting, 3rd & Orange Street, up the length of State Street to Providence Friends Meeting on Providence Road. Look for us and join us en route! At the meetinghouse, families and friends are invited to learn more about all our town has to offer, participate in outdoor fun, and enjoy a delicious potluck lunch buffet. Please bring a side dish, salad, dessert or beverage if you like, we’ll supply the entrees. There will be guided crafts, games, and face-painting for children, childcare for little ones, a meditation labyrinth, music by the Trolley Stoppers, and merriment for all. Sunday, May 3rd has 3 happiness-producing events! Join us at Glen Providence Park at the west end of State Street for a lovely Spring Nature Walk led by one of park’s very knowledgeable volunteers. Enjoy the serenity of nature, spring flowers, song birds, trees in new leaf. Gary Stolz, your guide, will make sure you catch the park’s many treasures. Sunday is also the perfect day to share a laugh – it’s World Laughter Day! Head over to Rose Tree Park at 2pm and celebrate with the Laughter Yoga Club of Delaware County (Unitarian Universalist Church at 145 W. Rose Tree Rd if it rains – but it won’t!). Cap off a wonderful day with a Full Moon Bonfire at 5th & Jackson St in Media at 7:30pm. The weekday evenings will be filled with a variety of events focused on the many aspects of what makes us happy – family and friends, music and dancing, playing and being creative, laughing and having fun, and being engaged with a healthy, happy community. In honor of Happiness Week, the TTM Steering Group will have its Monday, May 4th meeting at the Shere-e-Punjab restaurant. Come meet the team! Join the Hapi drum circle at the Seven Stones Gallery on Tuesday, May 5th, featuring Hapi drums! On Wednesday, May 6th, sit in on a round-table discussion of what makes a happy and well community including people from many sectors of our town. Share a congenial potluck dinner with open mic entertainment on Thursday, May 7th at the Media Community Center – a fun place to show off your talents! Enter the Fair Trade bake-off contest at the potluck and win a cool prize! Check our calendar or our flier for all the details. Of course, it wouldn’t be Happiness Week without a Happy Street Dance Party! Join the dancing in Veterans Square between State and Front Streets around 6pm on Friday, May 8th when Springfield Healthplex Zumba teacher, Alex, will lead us in another Happy Dance, to the music of The Edge with Stephen Wise. Watch the videos (here and here) to learn & practice the dance steps so you’ll look cool! And here’s a video of last year’s flash mob to get you inspired. The band will play happy dance music for about an hour, after which we invite you to stay and enjoy the shops and restaurants in Media, many of which will be having Happiness specials that evening. 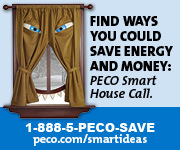 We thank the PECO Smart House Call program for generously co-sponsoring the dance party. And finally, Saturday, May 9th will be a fun-filled day! In the morning, Eric Stein, professor at Penn State Great Valley and former Borough Councilman, will give a talk on his hydroponic farm and how you too can grow healthy, tasty greens all year round (or buy them from his new CSA!). Then, from 1-4pm, we’ll put on a Happy Fair in Plum Street Mall. Among the attractions will be a seed and plant swap and sale – bring your extra seeds and plant cuttings and see what your neighbors have to offer! Local “green” vendor, Seed of an Idea, will be selling 100% certified organic seeds, seed-starting kits and a selection of organic edible flower planters that make great Mother’s Day gifts. Fifty percent of the proceeds of the sale will benefit TTM! Allison DeSalvo of World of Song will sing songs from her award winning children’s album “Happiness Is All Around You”! Come sing and dance along! Geared for kids 2 – 7 years but all welcome! Media’s Fair Trade Committee will be making their awesome banana whips. TTM’s Energy group will have information on reducing your energy use, getting inexpensive energy audits, and installing solar energy in your home. Rumor has it that the Media Free Store will be giving stuff away! Other groups will also be joining us with their own happy offerings. May 9th is also 2nd Saturday in Media, so many businesses are open late. Allison DeSalvo will present her YogAmi program for little ones at 10:30am and the Media Arts Council will have an art opening and music at their gallery on West State Street starting at 4pm. So make a day of it! All in all, it will be a great week! Stay tuned by checking our calendar of events (look for the events with the RED titles) or sign up for our newsletter. We hope you will come out and enjoy some of the many offerings – and be happy!